I hope that you were spared any damage from the recent heavy winds. In addition to blustery weather, there has been plenty of excitement in the Telehealth Group here at UNC Cancer Network. We are extremely pleased about transitioning to Zoom for our lecture attendees. Please see Jon’s article for details. Zoom will replace WebEx and GoToWebinar, making it easier than ever to attend a lecture. Please know that our team is here to support this transition every step of the way. For March, we have four great lectures planned, starting with our March 14th RN and Allied Health Lecture, Improving End-of-Life Care: What Can We Learn from the Bereaved? with Donald Rosenstein, MD and Justin Yopp, PhD. 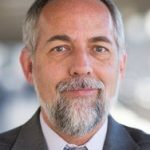 You can always find details on all of our different lecture series on our Events page at www.unccn.org/events. I want to thank Jon for his dedication to filling our lecture schedule for 2018. You can now go to https://unclineberger.org/unccn/events/UNCCN-2018-lecture-schedule and find a printable version of our schedule. You will note that we still have a few holes, this summer and fall, but we hope to have those filled shortly. Congratulations Jean Sellers for being named one of 24 recipients of the Triangle Business Journal’s 2018 Health Care Heroes Awards. It gives us great pleasure that our very own, Jean Sellers, RN, MSN, OCN, clinical administrative director at UNC Cancer Network, has been named a recipient of Triangle Business Journal’s 2018 Health Care Heroes Award. Jean demonstrates exceptional devotion to her field. Please join us in extending our heartiest congratulations! Please select the link below for additional information. 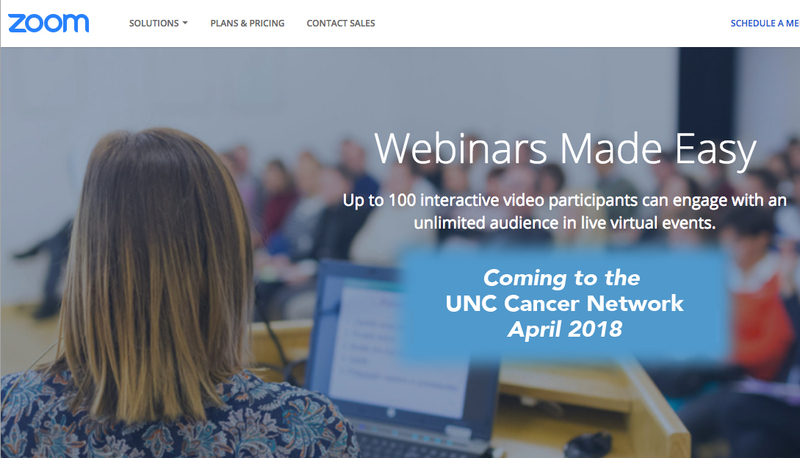 Throughout the last year, the UNC Cancer Network has used GoToWebinar to permit individual participants to view our Telehealth Lectures and Community Lunch and Learn Lectures from the comfort of their own computers. In the last few months, we have been finalizing plans to replace GoToWebinar (and WebEx) with a different webinar platform called Zoom. This platform promises to simplify our process of delivering lectures, while ensuring that our lecture attendees receive a high-quality webinar experience. Please note that sites that use video conferencing equipment (Cisco, Tandberg, Polycom) or Mediasite (usually in a group setting) will NOT be impacted by this change. Individuals interested in attending one of our lectures through Zoom will begin by registering for a given lecture in the same way that they have previously done using GoToWebinar. The registration links are available on the lecture website as well as in our event notification emails. Once someone clicks on the registration link, that person will answer a few short questions. These questions include requests for such information as name, email address, and organizational affiliation. Zoom then sends an email to confirm that the registration process is complete. This confirmation email should be saved where it can be easily retrieved, because it contains a unique connection link that is needed to access the webinar. This connection link will only work for one person, so each individual must register separately (and NOT share a Zoom confirmation link with a colleague). It also only functions for this one presentation, which means that a participant needs to register separately for each lecture that she or he wishes to attend. To join the lecture, click on the unique connection link shortly before the presentation begins. Once we open up the lecture to participants (30 minutes prior to the lecture start time), everyone will be able to see and hear (when we unmute) our host and presenter. After the lecture, another email is sent that contains important links. For our Community lecture participants, one of the links is for a lecture evaluation that helps us to improve our lectures and to plan future presentations. With the Telehealth Lectures, the primary link takes participants to our Learning Portal, where they can provide feedback and receive ASRT, ANCC, or CME certificates (provided they have attended the full lecture). These evaluations are available for seven days. We will share additional information regarding Zoom in late March, well in advance of our first Zoom-enabled lecture on April 11th. I want to reiterate that sites that use video conferencing equipment (Cisco, Tandberg, Polycom) or Mediasite (usually in a group setting) will NOT be impacted by this change. If you have any further questions about using Zoom, please contact the UNC Cancer Network at (919) 445–1000 or unccn@unc.edu. We will be happy to help.